I just got home from my first show of the season at the Southern Theater in Minneapolis, where I have a four-show season package. The Southern Theater presents unique and innovative works of theater, dance, music, and film (or some combination thereof) from many diverse companies, both local and national. It's a beautiful theater that celebrated it's 100th anniversary earlier this year. The theater itself has brick walls and a magnificent arch at the back of the stage, which is often used to advantage in the productions. 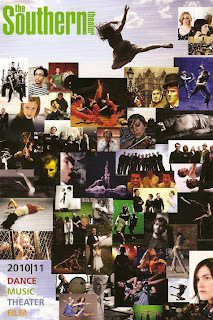 I've only been there once, for Theater Latte Da's lovely and innovative triptych of musicals The Passage of Dreams. I decided to get a season pass at the Southern to increase my exposure to other theaters around the cities. And my first experience was wonderful. Or, to quote a fellow theater-goer I overheard when leaving the theater, "It was weird. But it was good." Theatre Novi Most, which means Theatre of a New Bridge, was founded by Lisa Channer, the director of this piece, and Vladimir Rovinsky, an actor in the piece. According to their website, Novi Most "combines the artistic traditions of Russia and America to create dynamic physical theatre performances in which seemingly disparate ideas, languages and cultures can clash, commingle and cross-pollinate." They definitely succeeded with this production, The Oldest Story in the World, based on the epic of Gilgamesh. If you're like me, you've heard of Gilgamesh and vaguely recall reading it in college, but don't remember much about it other than there's some kind of beast. Let me summarize: Gilgamesh is the king of Uruk (an ancient city near modern-day Iraq) and is two thirds god and one third man. He's arrogant, and to teach him a lesson, the gods create a foe/friend for him, Enkidu, who is two thirds animal and one third man. They fight a monster, Enkidu is killed, and Gilgamesh is cursed to mourn for the rest of his days. He fears death and so seeks out the one immortal, Utnapishtim, to ask him the secret of beating death. The first translator of the story, George Smith, is also a character in the play. This production felt so epic that I was surprised when I left the theater to see that only 90 minutes had passed. It felt like I was in there for a hundred years, but in a good way! It really felt out of time, with the ancient story mixed with modern set pieces, including flickering TVs, file boxes, and pool cues. I'm not sure if this would be classified as a play, a musical, or a dance piece, but it was really partly all three. There was a chorus of three singers who would sing parts of the epic of Gilgamesh, in a haunting way that evoked a sense of the ancient, while still seeming modern at times. And the movement and choreography was beautiful. 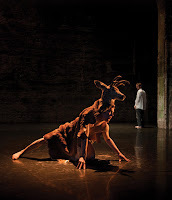 The part-animal Enkidu, played by U of M student Billy Mullaney, really did move like an animal. 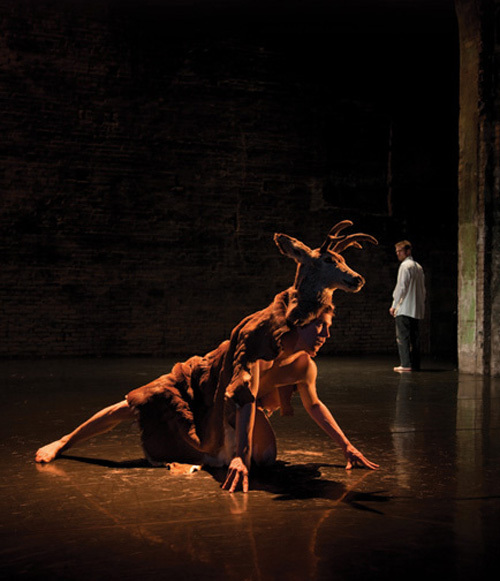 He and Erik Hoover, who played Gilgamesh, danced and fought beautifully together. The five gods were dressed in modern yet classic clothing, and watched the mortals, laughing or crying. Utnapishtim and his wife were like an old married couple, blessed (or cursed?) to live together for eternity. According to the epic, the gods created humans and gave them life, but also death, so that they would appreciate their life. Because it's the knowing that it's temporary, that it will end one day, that gives life meaning. "Enjoy your life, spend it in happiness. Savor your food, make each day a festival. Let music and dancing fill your rooms. That is the only way for us to live." It struck me as so amazing that words written over 3000 years ago are still so true today. Something so simple, but something humanity has struggled with since its existence. And if this was known 3000 years ago, why are we still so messed up today? Life is a constant struggle to re-learn this lesson. And theater is a powerful way to do it. As Lisa wrote in the director's note: "Myths are personal things. They are the breadcrumbs our smart ancestors left us to find our way back to them and thus to ourselves... we are all really the same quivering human souls regardless of time or place."